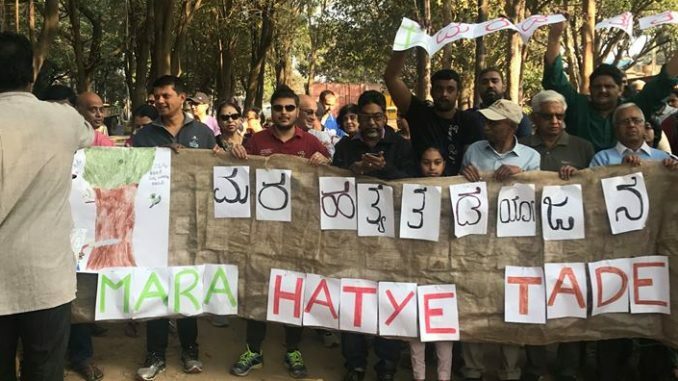 Srinivas Alavilli, co founder of Citizens for Bengaluru said “This yojane is in response to the marking Of 144 trees on Bellary Road by KRDCL. KRDCL seems to be making preparations for cutting these trees for elevated corridor project. However, environmental impact assessment(EIA) has not been done and environmental clearance has not been granted for this project. Due process was not followed and public consultation not held in violation of KTCP Act. This is also the reason for NGT and High Court not clear the earlier steel flyover project. There is massive public opposition because viable alternatives that do not involve killing trees such as public transport are not being considered. Thousands of post cards have been sent to the CM and the DCM asking for public consultation #JanaraMaatuKeLi and we are not sure if they are reading them. The need of the hour is to create inclusive forums to come up with a sustainable transport plan, not yet another project! Marking these trees is disregarding the law and public sentiment. To show our solidarity with our beloved trees we gathered in peaceful assembly and took a pledge (see below). Government after government is keen to announce various yojanes that seem to destroy our precious green cover. In response, we would like to commit ourselves a to #ಮರಹತ್ಯೆತಡೆಯೋಜನೆ. #MaraHatyeThadeYojane. CfB volunteers along with members of various environmental and civic groups, resident welfare associations participated. Mr Vijay Nishant Tree doctor explained the history of trees of Mekhri circle and the efforts being made to protect the bio diversity of Bengaluru, and Mr DT Devare Trustee Bangalore Environment Trust highlighted the results of environmental studies and effects of pollution, Satya Sankaran, Bicycle Mayor, Mr Ramesh Dutt President CAF, Chitra Venkatesh President Kumara Park RWA, Kumar Jahgirdar and many civic leaders took part. Time to approach the NGT again. The duplicity of Karnataka’s politicians need to be exposed.